Winner of the Charleston Trident Homebuilder’s Association 1997 Prism Award for Best Resort Home, the Cowart residence is very symmetrical. 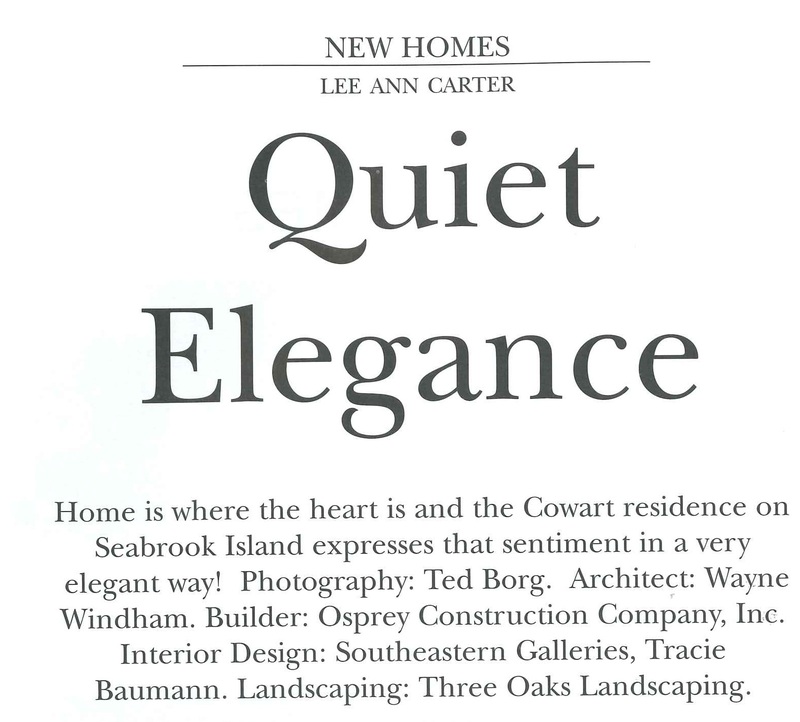 Farris Cowart of Osprey Construction Company, the builder of the home, was involved in every detail. Retaining the majority of mature vegetation was a primary goal of the Cowarts. John Hires of Three Oaks Landscaping mentioned, “We tried to retain the natural look of an old pasture, which it used to be. The rear of the property overlooks Horseshoe Creek and the mature live oaks were left in place to provide a shady canopy. Shrubs and plants were planted for different seasonal interests.” The placement of the home was dictated not only by the existing vegetation but also by the view. Every room except for the dining room and master bath embrace the panoramic marsh view. Turning onto the drive, which was designed to wrap around the existing wax myrtles, you are greeted by a Stylus Lucas brick “welcoming arms” staircase. Lined with concrete planters bursting with shades of fall color, the staircase beckons you to the welcoming front verandah. This verandah, flanked on either side by bow windows, showcases the perfect symmetry of the home. 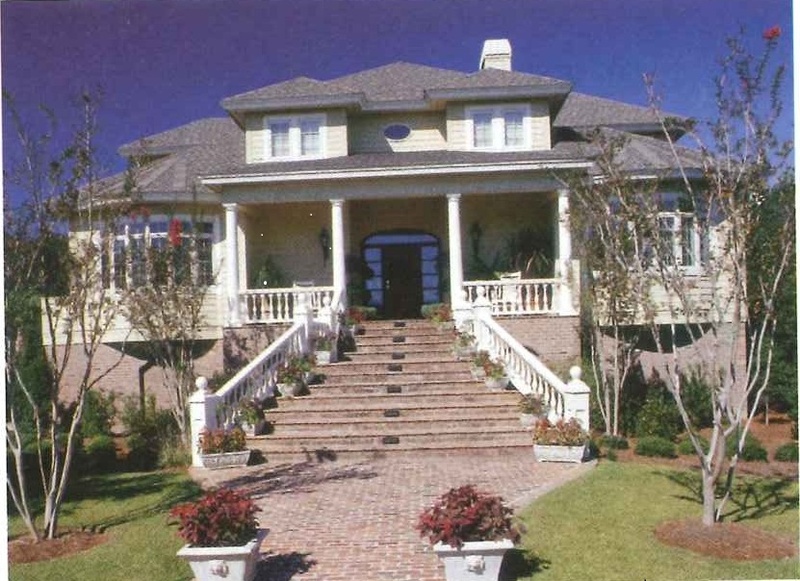 Stately white Tuscan columns offset the richness of the classic mahogany front door and transoms. Upon entering the soaring two-story foyer it becomes apparent that Farris, Owner and Partner of Osprey Construction Company, Inc. and his wife Jackie, a retired high school business education teacher, have created a graceful home full of warmth and comfort. A stunning hand-rubbed gold chandelier is the centerpiece of the entrance way. Capturing the different shades of gold from this chandelier are two Chinese inspired lamps resting atop a mahogany and granite Ralph Lauren console table. Conveniently located off the foyer, the powder room is one of my favorite rooms! On a trip to the North Carolina Mountains, while browsing through an old junk store, Farris spotted a 1920’s dining room buffet with serpentine side doors. A master craftsman, Farris purchased the buffet for a future project. Deciding that it would make a perfect powder room credenza, Farris refinished it with crotch mahogany, then added brass hardware and a Kohler Artist Edition handpainted flowered sink with matching floral faucets. Picking up the rich reds, Jackie chose an eggplant hue for the walls. The towel rack adds a touch of the unusual! The top part of an antique dresser mirror frame, it has been refinished and pegs added, making it stylish as well as functional. “I like the rustic look of the towel rack with the elegance of the rest of the room,” Jackie told me. Another unique touch is the antique copper calling card stand. Entering the sophisticatedly appointed living room through two sets of Tuscan twin columns your eye is immediately drawn to the custom fireplace mantel. Designed and constructed by Farris, the detail work is exquisite, making it truly a work of art! Built-in bookcases along with dental moulding and window cornices are more examples of Farris’s talent and craftsmanship. From the Maitland/Smith ostrich leather cocktail table to the Jacobean animal print chairs flanking a gaming table, this room is filled with unique and eclectic pieces. 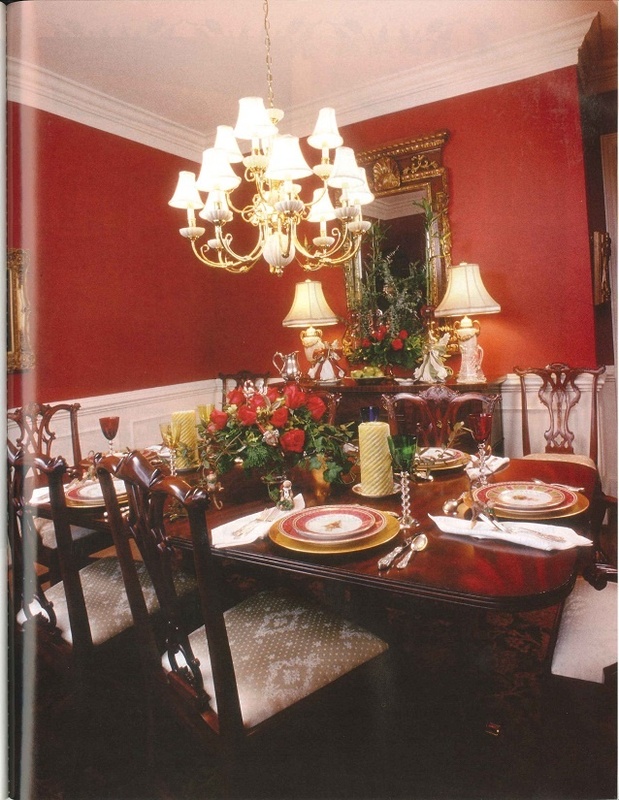 The soothing palette of reds, olives and golds is accented by Jackie’s collection of Spode and Flow Blue china. In the living room, overstuffed reading chairs are positioned to enjoy the fireplace. Three sets of French doors leading to the rear porch help bring the outdoors in and allow for an unhindered marsh view. Natural outdoor light reflects through the wall of French doors that lead to the tiered rear porch. The level nearest the house is shaded and has a wrought iron table and chairs perfect for brunching al-fresco. 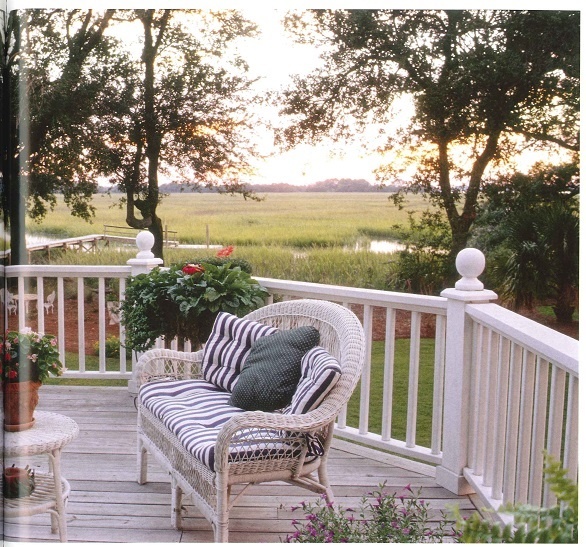 Comfortable white wicker chairs complete with blue and while cushions invite you to sit and enjoy the relaxing marsh view. Located on the lower tier and convenient to the kitchen through the breakfast nook door is Farris’s custom designed BBQ grill. This state of the art gas grill and side burner is recessed into a cedar shake cabinet with Spanish cedar doors, a Mexican tile counter and rustic hardware. More of Farris’s handwork is evident in the unique plant stands he has created from antique sewing machine bases with Corian or granite tops. With the kitchen, breakfast nook and sunroom to the right of the living room, the house flows nicely and is very “user-friendly” for entertaining. White cabinetry with white Corian offers a nice contrast to the cherry center island and its Verde Fontaine granite counter. Tiled into the backsplash to the right of the sink is a colorful cornucopia of flowers and fruits overflowing a graceful urn. 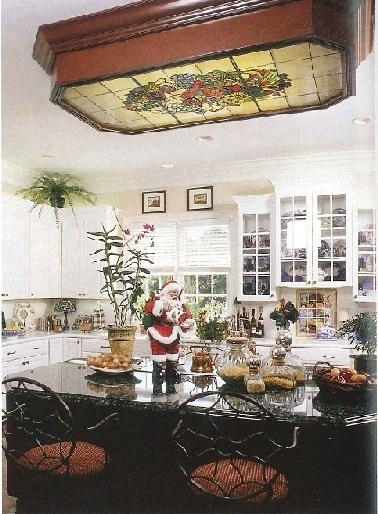 Over the center island is a light box constructed of cherry featuring a custom designed stained glass panel. Artist Susan Suffel told me, “The stained glass design is what I envisioned the top of the tiled flower urn to look like if you were gazing down on it.” Windows surround the sunroom and breakfast nook filling them with natural light and maximizing the spectacular view. Along with the entire house, this room is filled with plants. “Before Farris and I married I had a greenhouse and I wanted our home to reflect my love of plants,”Jackie said. A cozy room perfect for watching TV or curling up with a good book, the sunroom features a Lillian August settee in shades of red, gold and pumpkin which coordinate perfectly with the two Drexel Heritage wing chair recliners and a round reading table with a chenille paisley topper. An antique sewing machine found scattered in pieces in an old garage, was painstakingly reconstructed by Farris and is on its way to becoming a treasured family heirloom. The bamboo paddle fan brings a touch of the islands to the room. “I like to throw in the unexpected,” said Jackie. Resting on the window cornices, adding holiday cheer are Farris and Jackie’s collection of a Dickens Christmas Village. The center cherry island with custom stained glass paneled light box is a striking contrast to the white cabinetry used throughout the rest of the kitchen. Holding court in the stately dining room is a Maitland/Smith mahogany table, chairs and sideboard. A Theodore and Alexander mirror reflects the beautiful Royal Albert Old Country Roses Christmas china. Victorian reproductions of Monkey lamps from Chelsea House along with monkey ornaments and napkin holders add a whimsical touch. Rich deep red walls framed with white wainscoting and moulding complement the Maitland/Smith mahogany table, chairs and sideboard. A Theodore and Alexander mirror reflects the beautiful Royal Albert Seasons of Color Christmas china. Located at the other end of the home for privacy is the master suite. Calming green seafoam walls with white moulding make for a soothing respite from the rest of the world. All colors and fabrics are soft and peaceful and work well with the four-poster pineapple bed and writing desk. 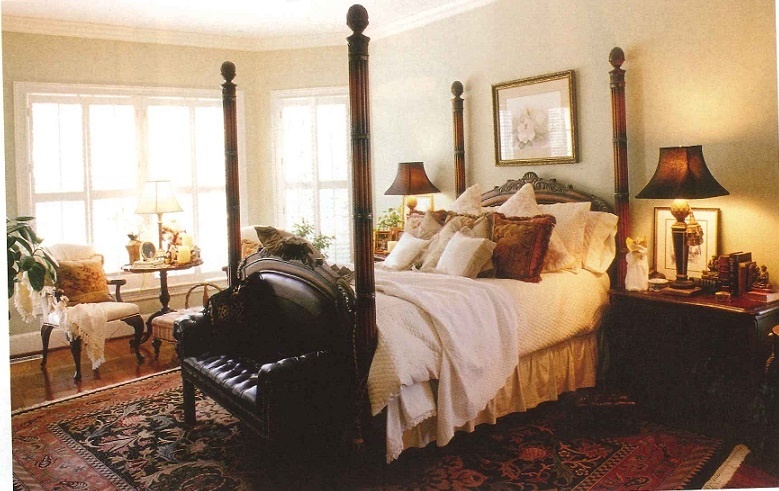 An antique green and blue Oriental rug placed at an angle on the oak stained mahogany hardwood floor complement the chosen fabrics and bedding. Artwork here, as well as through out, is mainly from a Savannah artist, Sharon Saseen Dillon. Since Farris and Jackie are both from the Savannah area, Dillon’s work reminds them of home! The E.J. Victor French Legacy four-poster pineapple bed makes a beautiful statement in the master suite. This tub is the perfect place to soak away the troubles of the day! 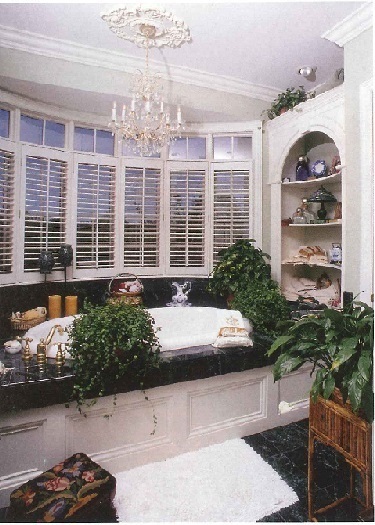 Curved shelves at each end of the tub follow the progression of the bow windows. Adding an artistic touch on the second floor staircase is a Chelsea House chinoiserie folding screen featuring birds and foliage in shades of black, gold and red. 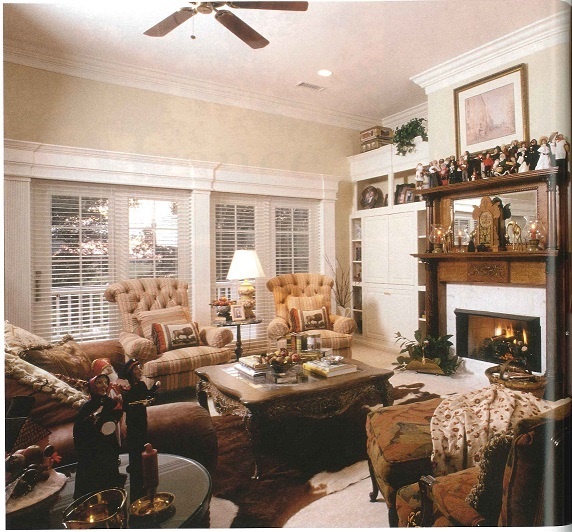 The upper level houses the Charleston library room and two separate bedrooms each with full baths. While masculine in feel with a leather couch and khaki, beige and deep red striped fabric chairs, the library also has a TV, VCR and computer, perfect for keeping the grandchildren entertained! This room, just like the entire home, contains many antiques in addition to treasured family pieces and “junk store finds.” French doors open to an upstairs balcony, providing another fabulous waterview. The upstairs Charleston library holds treasured eclectic pieces that when put together with Jackie’s eye for detail blend perfectly! 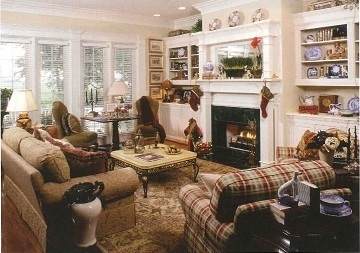 More of Farris’s handiwork is shown in the design of the fireplace mantel on which rests their collection of Byers Choice Carolers. In the guest room on the right hangs the framed marriage certificate of Jackie’s parents. The soothing palette of roses, pinks and creams are also highlighted in the adjacent bath. The guest suite to the left has been decorated in blues, reds and creams and hosts a separate dressing area along with separate bath. This bath, in addition to the usual cabinetry has a unique antique dressing table with full-length mirror and needlepoint antique chair. Emanating a sense of quiet elegance, and showcasing furniture and collectibles from traditional to French to custom designed one-of-a-kind creations, every pieces in the Cowart home has been chosen and placed with care, concern and love. Definitely creating a home with a heart. This entry was posted in Carolina Homes & Gardens, Magazine Articles and tagged Byers Choice Carolers, Charleston SC, Charleston Trident Homebuilders Association, Farris Cowart, Horseshoe Creek, Jackie Cowart, Kohler, Lee Ann Carter, Maitland/Smith, Osprey Construction Company, Prism Award, Savannah, Seabrook Island, Sharon Saseen Dillon, South Carolina Homes & Gardens, Southeastern Galleries, Susan Suffel, Three Oaks Landscaping, Wayne Windham Architect on August 10, 2015 by Lee Ann Carter.